Dining in Lisbon is far more dynamic than navigating countless preparations of Portugal's beloved bacalhau (dried and salted codfish; 365 recipes and counting!). While bacalhau à Brás(shredded cod with onions, eggs and potatoes; a Bairro Alto original) is never far, Lisbon's strategic seaside position on Europe's doorstep means a bounty of fresh seafood (octopus, tuna, monkfish, shrimp, sardines, clams, snails) rules the city's kitchens, from Michelin-starred restaurants to gourmet-food markets to countless corner tascas (taverns). Top-grade Alentejan beef beckons with juicy steaks and gourmet burgers, and you'll find everything from tantalising Indian curries to authentic Moroccan couscous in between. You couldn't blame your average lisboêta for thinking of the Apocalypse when the ground gave way just before 10am on 1 November 1755. What followed was eight astonishing minutes of city-shattering shaking spread across three tremors, followed 40 minutes later by a massive, city-engulfing tsunami, culminating in a week-long firestorm that incinerated what little was initially spared. Lisbon was decimated. Today, the modern city is shaped by these cataclysmic events – nearly everything is defined as before or after the earthquake – and the Pombaline architecture that defined post-quake Lisbon reconstruction was some of the first seismically protected building in Europe. By far the best way to explore Lisbon is to walk. Despite being hilly, the city is full of hidden gems that will surprise you at every turn. Whether its magnificent views, a little kitsch shop or just amazing street art, you’ll never find it unless you’re walking. You can also rent a car or take metro or bus or call Uber. This area used to be the harbour and departure point of all the Portuguese ships in Discoveries Era. You can breathe history here amongst the majestic monuments, spacious gardens and gorgeous river views. Many things to keep you busy here. The overcrowded Torre de Belém (Belém Tower), the imponent Padrão dos Descobrimentos and the intricate Mosteiro dos Jerónimos are all ode to the glorious Portuguese past as well as beautiful photo opportunities. Belém is also the museum district of Lisbon, where locals go for their monthly cultural dose. Alfama is, in essence, a labyrinth of steep cobblestone streets who up until recent years were the most traditional part of the city. These days, every other door is an Airbnb apartment, but somehow the essence still lingers by. Great neighbourhood to get beautifully lost and find kids playing soccer, neighbours chit-chatting or putting the laundry out to dry. Many places worth to visit in the surroundings. Sé Catedral and one of the many miradouros(viewpoints). My favourite is Miradouro da Nossa Senhora do Monte and Miradouro Portas do Sol with its absolutely gorgeous panoramic views facing east and southwest of the city, respectively. Both are great places to grab a cup of wine and take it all in. Despite being increasingly touristy, Lisbon is still far from being uncovered and most of it the hidden beauty lies in these parts. Places like the overlooked Museu do Azulejo (Tile Museum) or the bi-weekly flea market of Feira da Ladra are true hidden gems. Crowning this maze of authenticity and sitting on the highest hill of Lisbon, the millennium-old Castelo de São Jorge also deserves a visit. For a better experience, time your visit for the sunset. 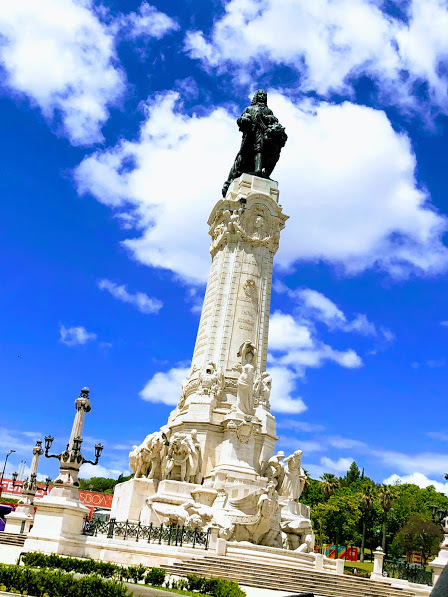 Contrasting to the rest of the city, the downtown area of Lisbon – Baixa Pombalina – has ordered streets, majestic buildings and consistent architecture. This is where visitors usually spend more time. My personal favourite is Praça do Comércio (Comércio Square): the grandest of the squares in Lisbon and one of the largest in Europe. Historically this was the gateway to the city, where goods from the colonies were traded. Be sure to take a look and go up Rua Augusta Arch, on the northern end of the square and Cais das Colunas, a popular relaxing spot next to the river. Also in Praça do Comercio, you can find the iconic café Martinho da Arcada, a favourite from legendary Portuguese writers like Eça de Queiroz and Fernando Pessoa. A bit further up opposite the river, Rossio is the very heart of Lisbon. The beautiful wave-inspired cobblestone pavement – calçada Portuguesa – covers the entire square. TIP: Most restaurants in Baixa are tourist traps, offering mediocre food at big prices. Avoid eating in this area. These are two very different neighbourhoods sitting very close to each other. Chiado is the elegant and artsy district, beloved by many poets and writers. Place of theatres, old bookshops and fancy restaurants, you can find a real-sized statue of Fernando Pessoa in A Brasileira, one of Chiado’s century-old cafés. Most of this bustling area was destroyed in a massive fire in 1988 but has since been reborn. Together with Avenida da Liberdade, Rua Garrett holds the title for the more expensive real estate of Lisbon. My favourite place: the leafy Praça das Flores, one of the most chilled spots in the city. Finally, I HIGHLY recommend you take a day trip to the fairytale village of Sintra. Here, imposing castles and ancient palaces live in harmony with exotic gardens and greenery. This is a UNESCO World Heritage Site for a reason. There are sights in Sintra to keep you busy for a whole day. From the mysterious Quinta da Regaleira to the intricate Palácio de Montserrat or the iconic Castelo dos Mouros. The main attraction, however, is Palácio da Pena, a colourful Disney-like palace brimming with over-the-top designs. It is located on the very top of a hill and from up there, you can delight yourself with breathtaking views from all the Sintra, Cascais and Lisbon region. Go early as it gets really crowded after 11am. Fado is the most unique type of Portuguese music an integral part of Lisbon‘s culture. It’s beautifully melancholic and you’ll most likely feel the song if you don’t understand a word of they’re singing. That said, deny any suggestion of guides trying to shove down your throat suggest dinner + Fado shows as one of the most authentic things you can do in Lisbon. Why? The price. The dinner + fado combo “packages” cost anywhere between 40-60 euros which is a total rip-off. In some, drinks are not even included. The food. One word: mediocre. Not a “local” experience. Very rarely locals this. Fado shows are the equivalent of flamenco shows in Spain. There’s hardly a better destination for foodies. Lisbon is packed with great food at delicious prices! Make sure you try the most popular local specialities. The restaurant scene is more alive than never. There’s a place for every budget and type of food. One thing I love about Lisbon is how down-to-earth it can be. “Going out” in the city can be as simple as grabbing a drink from a bar and drinking on a street in Bairro Alto. And it’s damn fun. There are fancier cocktail bars and clubs, but for this, you can go everywhere else in the world, right? This part of Lisbon is mostly known for its nightlife with loads of unique bars and nightclubs around. People gather around Rua Nova do Carvalho, also known as Rua Cor-de-Rosa (Pink Street). Have a drink at Pensão Amor, which used to be a cheap pension with rooms rented by the hour to prostitutes and their clients. The 18th-century building has a total of 5 floors and amongst its burlesque decoration, you can find old posters from peep shows, poles and other suggestive items. During the day is one of the oldest and most traditional neighbourhoods in Lisbon. At night, especially during weekends, this maze of cobblestone streets gains a new life and turns into the city’s major nightlife hotspot. Timings are everything. Locals usually have dinner between 20:00 and 21:30 and don’t go clubbing before 1 or 2 in the morning. Most people will grab a drink in Bairro Alto or Cais do Sodré. If you’re looking for a more chilled location, try Bica and the street along the funicular line (Elevador da Bica). The most famous – and allegedly best? – nightclub in Lisbon is Lux (Av. Infante D. Henrique, Armazém A, Santa Apolónia). This converted warehouse is known for its eclectic electronic music. I found Lisbon super safe even for a solo woman traveller like me. I could be walking very safely, the streets after my milongas late at night. Never had any problem. But as a tourist, do take precautions. I have heard that public transport might have pickpocketing. But my personal experience tells me that it is one of the safest places to be. I went in early June and the weather was perfect. Never experienced anything better. Not hot, not cold- just perfect and pleasant. I have heard excellent reviews about the weather all year round. 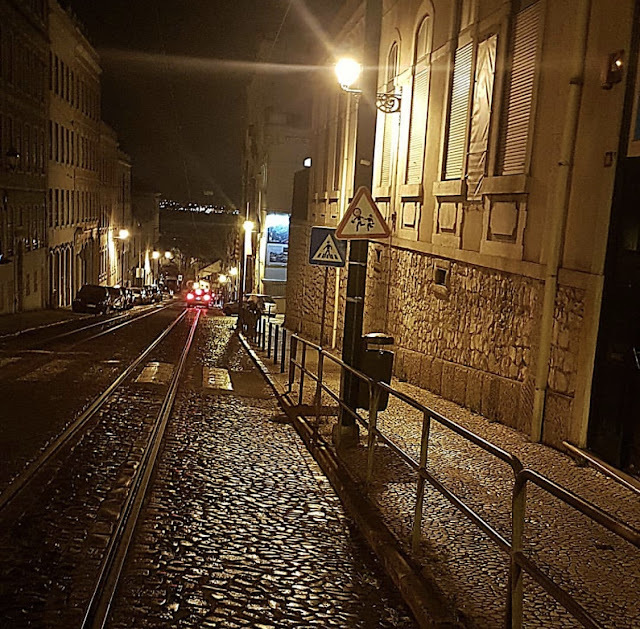 Streets of Lisbon after our milonga at night. When in Lisbon, enjoy Porto wine. It is cheap and delicious.